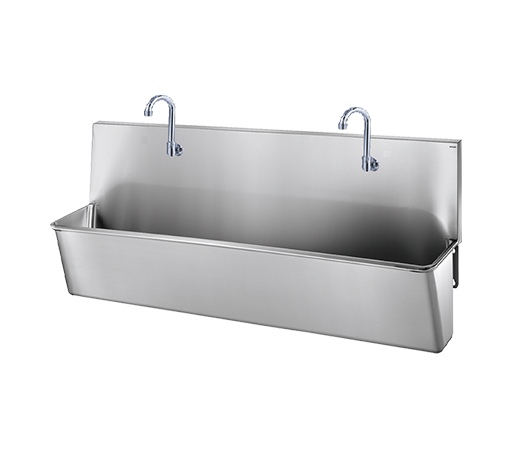 1, 2 and 3 taps Stainless steel scrub up trough made of stainless steel. The material is 304 SS with bacteriostatic surface. Our stainless steel surgical scrub sinks offer a surgical hands and arms scrub with a great comfort. it also can be equipped with the same water treatment and hygiene options as our polyester scrub sink range. 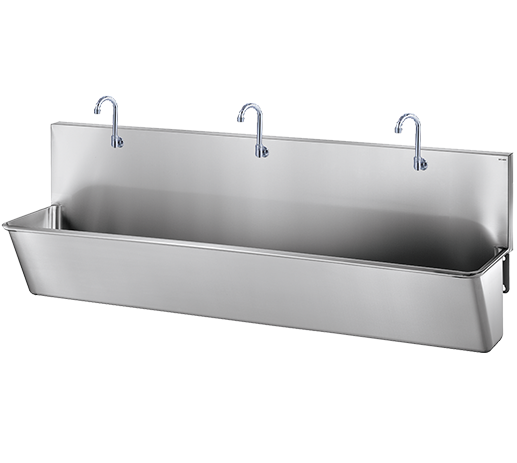 Medical Process stainless steel scrub up trough has rounded internal surface and wide deep bowl. this makes the cleaning easier and avoids bacteria’s niche developpement in the corners. This SS medical scrubs can be equipped with all our accessories such as soap dispensers with quick release clips on wall mounted medical aluminum rail. Targeted services: Dental surgery offices, cosmetic and plastic surgery offices, emergency rooms, intensive care units, nephrology and dialysis units, critical care, neonatal unit, nursing room, box of emergency nursing, clinic. The surgical scrub sink MP’UNO-SS is available with four touchless types of water command. It also can be equipped with mechanical or automatic soap dispensers, paper, or nail brush dispensers. We also offer a complete solution for water treatment depending on the network water quality. Targeted services: Dental surgery offices, cosmetic and plastic surgery offices, emergency rooms, intensive care units, dialysis units, critical care, neonatal unit, nursing room. Rounded internal shapes for low infection risk and easy cleaning. Sanitary antibacterial 304 SS surface. Auto flush infrared sensors to drain the stagnating water. High back-splash to protect the area from drops. Wall mounted faucets only to reduce bacteria’s niches.